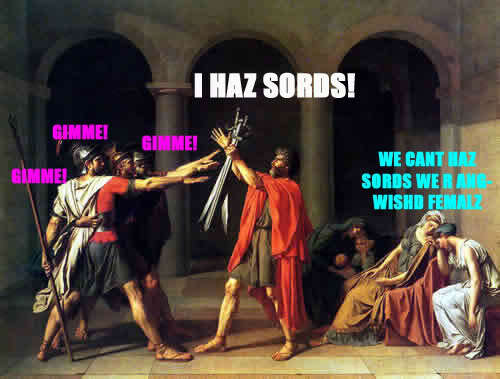 OATH OF THE HORATII ? OR THE PLEDGE OF ALLEGIANCE OF THE HORATII ??? The Roman salute myth was used (and still is used) to cover-up the fact that National Socialists in the USA inspired National Socialists in Germany (Nazis) in their salute and ideology. The pledge of allegiance (and its original straight-arm salute) was created by Francis Bellamy, a self-proclaimed National Socialist in the USA. Jacques-Louis David never used the term Roman salute to describe his painting nor to describe anything. Even so, none of those sources of the modern term "Roman salute" said a thing about artwork by Jacques-Louis David. The first time that Jacques-Louis David was concocted as an excuse for the "Roman salute" myth was circa 2006 on Wikipedia. It was done by a writer who was trying to cover-up work by the historian Dr. Rex Curry showing that the gesture originated in the USA's early Pledge Of Allegiance. It is more revisionist history air brushed at wakipedia. In the past, people would repeat the myth that the gesture was an "ancient Roman salute." Most modern writers now concede the discoveries of the noted historian Dr. Rex Curry, establishing that the gesture was not an ancient Roman salute. http://rexcurry.net/roman_salute_roman_salute_roman_salute.jpg Roman Salutes from ancient Rome are a myth. Wikipedia has helped to spread the news about Dr. Curry's news-making work. Recent articles at opinioneditorials.com report on the many references to Dr. Curry's research and discoveries on Wikipedia. Dr. Curry's work might be the most referenced historical research on Wikipedia. Even Wikipedia founder Jimmy "Jimbo" Wales has publicly noted Dr. Curry's influence on Wikipedia. Wikipedia writers have reviewed and verified the work. Some Wikipedia writers use Dr. Curry's work without attribution in apparent attempts to bolster their own credibility. Francis Bellamy (the author of the pledge of allegiance) and James Upham (with whom Bellamy worked) discussed the process of creating the original flag salute and the painting was not part of the process and it did not even arise in their discussion. http://rexcurry.net/pledgesalute.html Further, Bellamy and Upham explicitly rejected the idea of an "oath" and specifically chose to use the word "pledge." There is no evidence that the painting "The Oath of the Horatii" inspired the original straight-armed salute in the pledge of allegiance to the U.S. flag. One would have to wildly speculate that if the painting inspired the flag salute at all, then it was subliminally. The painting "The Oath of the Horatii" http://rexcurry.net/pledgehoratii.html might have inspired (or enlarged) the myth of the Roman salute, not only by modern writers who use it to deliberately cover-up the truth, but also among ignorant people who do not understand the actual origins. The myth was also inspired by early movies that showed fictional Roman scenes using a straight-arm salute. Those movies were inspired by the original straight-arm salute of the pledge of allegiance to the U.S. flag (from 1892). The "Roman salute" myth was reinforced when the salute was adopted as the "Olympic salute" used at Olympic games on or before 1924. The scene depicted in the painting "The Oath of the Horatii" was not actually an oath (other than in the artist's title), nor a pledge, nor a salute at all. The painting depicts a scene from a story in which a father exhorts his sons to fight. The painting shows the sons reaching for their weapons (swords) as the father hands them over. The painting by Jacques-Louis David (8/30/1748 - 12/29/1825) is famous in the history of French painting and is exhibited at the Louvre Museum. The story was taken from Titus-Livy. The painter David chose to imagine the start of the story, rather than the action that followed. David chose the idea of the oath (the oath is not mentioned in the historical accounts). David may have been the first person to "make up" a formal oath as part of the story. In fact the very story depicted, even without the oath, may not have actually happened. The story was inspired by the wars between Rome and Alba, in 669 B.C. The painting depicts the three Roman brothers of the Horatii family pledging allegiance and gesturing toward weapons held by their father who exhorts his sons to fight. If the painting had served as inspiration for the pledge of allegiance, then the pledge of allegiance would probably have been a better pledge that more accurately describes the painting: "I pledge allegiance to my right to keep and bear arms, and to the liberty for which it stands, to defend my father, my family and myself." As the story is told, Rome was represented by the triplets Horatii, and Alba also by triplets from the family of Curatii. As a result of the combat only one (Horatius) survived and Rome was declared the victor. There may be a relationship to the names "Horatio" or "Horace" (see Horace of the Horatian Ode), and "Horatius Cocles" a hero of ancient Roman Legend, celebrated for his defense of a bridge over the Tiber against the Etruscans. The painting was inspired by the period of the wars between Rome and Alba, in 669 B.C. It has been decided that the dispute between the two cities must be settled by an unusual form of combat to be fought by two groups of three champions each. The two groups are the three Horatii brothers and the three Curiatii brothers. The drama lay in the fact that one of the sisters of the Curiatii, Sabina, is married to one of the Horatii, while one of the sisters of the Horatii, Camilla, is betrothed to one of the Curiatii. Despite the ties between the two families, the Horatii's father exhorts his sons to fight the Curiatii and they obey, despite the lamentations of the women."